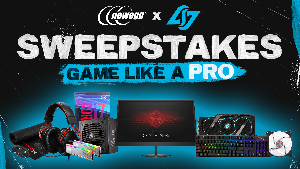 Prize: a monitor; (ii) a gaming headset; (iii) a gaming keyboard; (iv) a gaming mouse; (v) a motherboard; (vi) a video card; (vii) a memory stick; (viii) a desktop processor; and (ix) a power supply device. Approximate Retail Value (“ARV”): $2,774.91. Statistics: This contest was opened by 50 and entered by 5 ContestChest.com members. 10% of those who opened the contest, entered it.